Ready for another adventure with us? 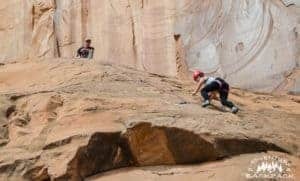 How about rock climbing Wall Street in Moab?! 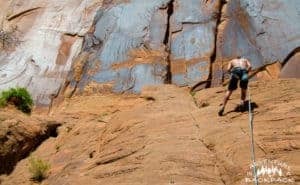 There is a wall of awesome rock climbing just north of Moab on Highway 279. It’s a wall right off of the street, hence the name Wall Street. We had heard great things about it, so of course we had to check it out! The cool thing about this climbing location is that it is right off the road, so there is no approach. You really just pull up in your car and start climbing! 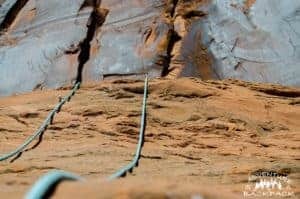 That being said, be careful while you are belaying not to accidentally step into the road; it is a highway, although it’s not terribly busy. There are climbing routes along this street for about a mile, and they range from beginner 5.5’s to expert level climbs. 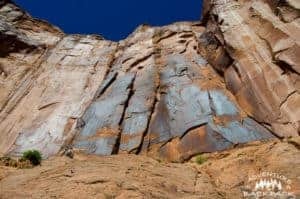 Most of the routes you will find for climbing Wall Street are sport routes, meaning they have bolts in the rock to enable you to clip to them while lead climbing. This is the type of climbing that we do currently, as we are not experienced enough just yet to climb without bolts. We climbed several routes from 5.5 to 5.8 level. Nate lead climbed the routes and set up a top rope for Steph to climb (check out the video for more on what that means). The routes were fun and it was super interesting how well your shoes stuck to the rock! We felt like a couple of geckos just scurrying up the rock! We are always trying to learn something new while we are out on our adventures; from little bits of knowledge to learning a new skill. 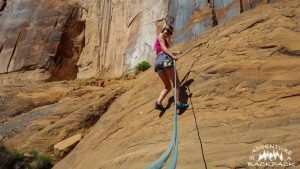 While we were climbing, Steph self-rappelled for the very first time! Although a tad nervous about it, she did great and now she knows a new skill. This is great for her, because she is often in a predicament that a belayed rappel causes too much drag and she doesn’t weigh enough to get down. Self-rappelling is much easier in that sense! 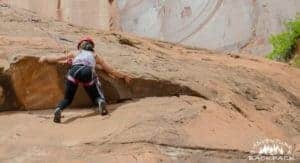 She really did rock that climb! Dad: Honey, you’re going all the way to the top. Daughter: Oh, I know, you ARE my parents after all! I know I’m going! Mom: We wouldn’t push you if we didn’t know you could do it! I don’t know why this stuck with me, but it was so encouraging to hear. She made it all the way to the top, and I must say she ROCKED it! I was happy to be able to see the encouragement it gave her to know that she had that support on the ground. And I think you can see here that her dad was quite proud! If you are interested in their travels, check out their website here! 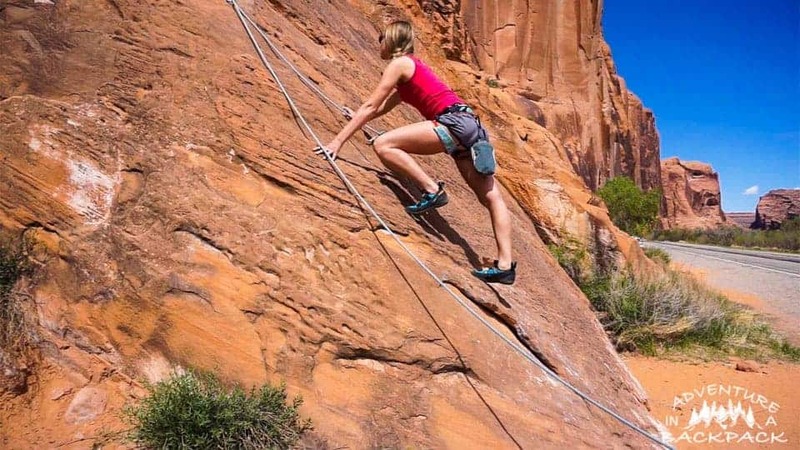 Would YOU Climb Wall Street? 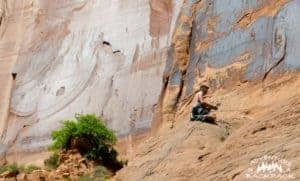 Let us know if you have climbed or are interested in climbing Wall Street in Moab! We would love to hear more stories and see more pictures. We could’ve climbed here for days and had tons of fun still! If you enjoyed this post, be sure to check us out on our other social media sites and subscribe to our page below! Until next time, LIVE VICARIOUSLY! Love those canyons!! I am jealous you are there in this great time of the year. 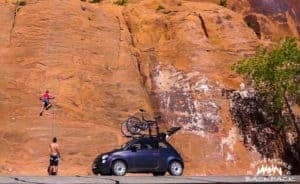 when you get near Vegas check out the climbs at Red Rock. Not as challenging but nice day or two.